Want to make a statement with what you are wearing? I've got you covered! 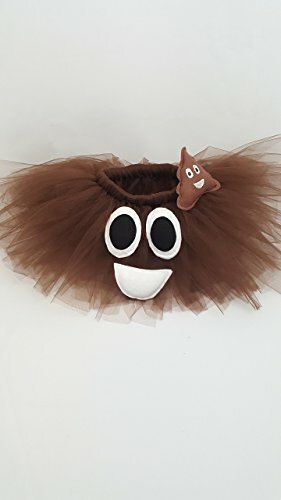 This Poop Emoji Tutu is perfect for parties, Halloween, photo shoots, as a group costume with friends, a cake smash, themed party, ballet class, and so much more. You cannot NOT have fun while wearing an Emoji Tutu! The tutu is made of layers of brown tulle that is soft and high quality. The face is 3-D and made of felt. This particular tutu has a simple white smile and two larger oval eyes with black centers. There is also a Poop Emoji on the waistband. All of these elements are stuffed and puffy. Fun! The waistband is made of a high quality elastic and stretches about 4 extra inches so you are able to wear something underneath without worry. This tutu is perfect for; *Photo Shoots *Cake Smash *Halloween *Birthday Parties and Photos *Dance Classes *Dance Performances *Everyday Use Don't see a size you need? No problem, just let me know and I can make one that works for you. If you have any questions about this product by Pearls and Tulle, contact us by completing and submitting the form below. If you are looking for a specif part number, please include it with your message.